In mid-May Lori Schneider sat at base camp, 17,500 feet up the side of Mt. Everest, hoping in a few days to become one of only about two dozen women to reach the world’s highest peak. It would be the culmination of a dream to climb the seven highest mountains on every continent. But in some ways it would be just one more step on a climb she began 10 years ago when she was diagnosed with multiple sclerosis (MS). 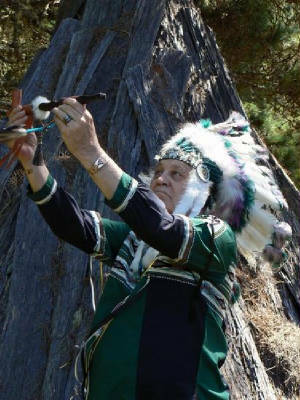 Across the globe, in Janesville, Wisconsin, Neal Schneider followed his 52-year-old daughter’s progress over the Internet and talked to her by satellite phone every fourth day. He couldn’t help but feel a father’s concern. More than 200 climbers have died trying to reach Everest’s 29,035 foot summit. No one with MS had ever made it to the top. Still, he believed in his daughter and knew she was in God’s hands. It was the elder Schneider who inspired his daughter’s mountaintop dreams. In 1993, the two of them celebrated his 61st birthday at the top of Mt. Kilimanjaro. "I felt like if I’d had to take one more step that would have been the end," he said. But Lori was far from done. That was the moment she began planning to scale the Seven Summits. Then, six years later, at age 43, she awoke one morning and had lost all feeling in half her body. It was, she said, "as if someone had drawn a dividing line down the middle of my body." The diagnosis: MS, a disease that attacks the central nervous system. At first, she was terrified. But soon she became even more determined to achieve her goal. She quit her job as a teacher and devoted herself full time to mountain climbing. "She looks at MS not as a negative, but a positive," her father said. "She accepted it as a challenge." In the next nine years, she climbed the highest peaks on six of earth’s continents, scaling Mt. Vinson in Antarctica last November. Now there was only one more mountain left. On May 17, a Sunday morning, the team of 11 climbers set out for the summit of Mt. Everest. They climbed past the crevasses of the Khumbu icefall and up the sheer sides of the Lhotse Face. Finally, after climbing more than 8,500 feet in five days, the team reached Camp Four, where it would rest for a day, building strength for the final 3,000-foot climb to the top. Back in Janesville, Neal Schneider checked the team’s web site regularly, looking for updates on his daughter’s progress. Finally, at 10 p.m. Friday—11 a.m. Wisconsin time—an update was posted. The team had left for the top. Hiking in the dark, the climbers wore headlamps for most of the trek. Dawn wouldn’t arrive until 4:30 a.m. The temperature was 35 below zero; winds of more than 60 miles per hour pummeled the climbers. Sometime after 7:30 a.m. the team converged with dozens of other climbers at the Hillary Step, a 40-foot spur of rock, snow and ice at 28,800 feet. Less than 250 feet remained, but many climbers have met their death here. Only one climber at a time can navigate the fixed ropes of the Step, leading to fatigue and delays, both of which can be fatal on Everest. Getting past the Step, Schneider climbed on, slowly and laboriously, breathing with difficulty even with bottled oxygen. Finally, the summit was in sight. She had made it! At 8:30 a.m., after more than 10 hours of climbing, she stood on the top of the world. After unfurling a banner in honor of the first World MS Day on May 27 she used a satellite phone to call her father. "I’m here dad," she said. "I’m on the summit. I made it." A quest, 16 years in the making, had been realized just as a new dream was beginning. Her life’s goal is to show everyone facing challenges that even the highest mountains can be conquered, one step at a time. Next she hopes to lead a team of people with MS to the top of Mt. Kilimanjaro, the mountain that first inspired her. "Money," Schneider wrote on her personal website, "is not the currency we use to pay for living our dreams…determination is." Evan Miller is a senior editor at GUIDEPOSTS. 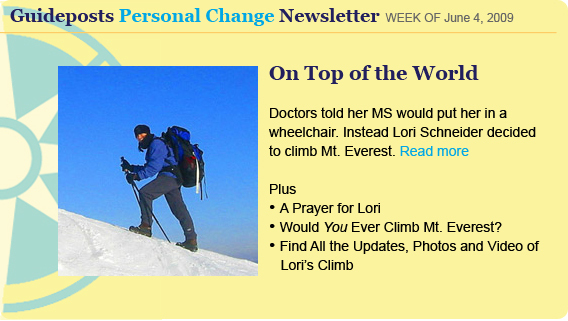 For Lori's story and previous updates, go to her Everest Climb page or check out her team website. Plus: Would you ever climb Everest?